Liz Hooper has written since 2000 and has published travel articles, essays and features for a variety of publications including "In Travel Magazine." She holds a bachelor's degree in writing from the University of Massachusetts. Liz is a certified personal trainer and holds a Bachelor of Arts in English and anthropology from University of Massachusetts. 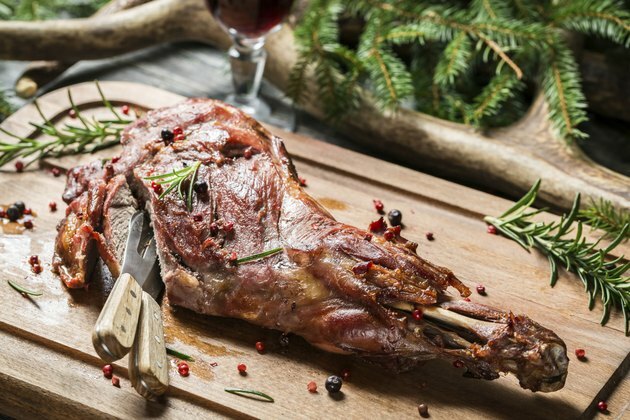 Venison, or deer meat, is available at restaurants and butcher shops, depending on the season and where you live. Venison is simple to prepare at home, as it can be added to stews, cooked in a crock pot, or grilled. Larger pieces of venison can be roasted, along with side dishes such as potatoes and vegetables, in your oven. Venison typically has lower fat than other game meats, and can be prepared with water for a healthier meal. Set your oven to bake and preheat to 375 degrees Fahrenheit. Place the venison in the roasting pan. Venison should be cooked with liquid to ensure that it doesn't dry out. Options for liquid include olive oil, wine, and onion soup mix with water. For the healthiest preparation, use plain water. Add 1 cup of liquid to start, then add more liquid if needed to ensure that the bottom of the pan is covered. Add side dishes to the pan, such as sliced potatoes, carrots and peas. Cover the pan and place in the oven to cook for 2 to 3 hours. Lift the cover every 30 to 45 minutes to check the progress of the roast. Add additional liquid as needed so that the bottom of the pan stays covered. Confirm that the meat is fully cooked. Insert a meat thermometer into the center of the roast -- it should register 160 F. Also slice into the roast to test the center. The meat should be slightly pink to fully browned. Slice the venison roast and serve with vegetables, rice and a salad. Add garlic, rosemary and thyme to the cooking liquid for additional flavor. Use sweet potatoes instead of white potatoes to lower carbs with the meal. Game meats cooked at high temperatures or left in the oven too long can become dry or gamey. Check the temperature with a thermometer and add additional liquid if the meat is dry.